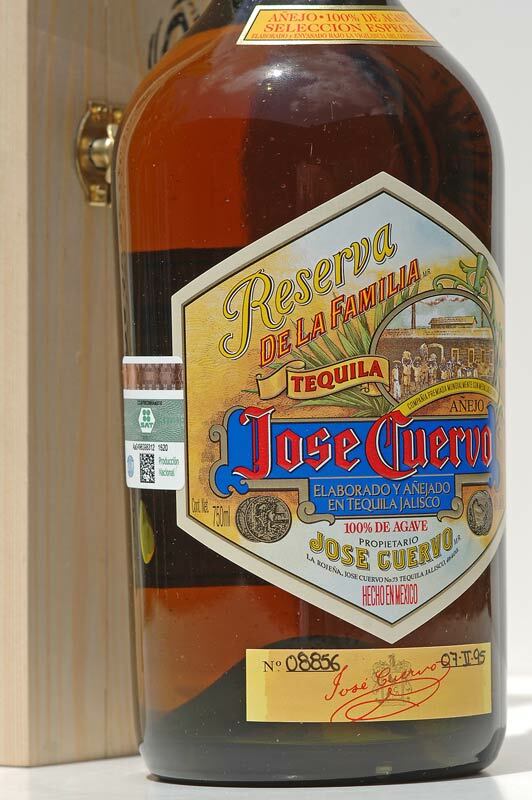 Photograph of tequila bottle and decorative box. 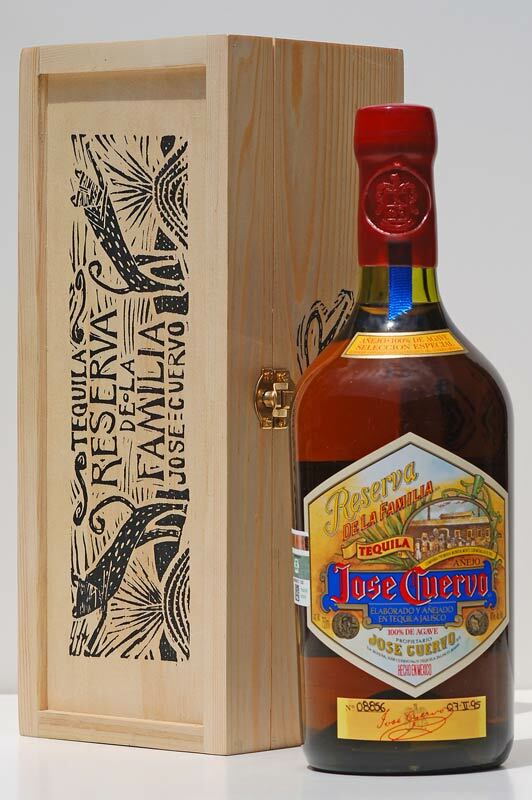 Jose Cuervo Reserva de la Familia Tequila 1995 Collection in a box with artwork by Mexican artist Joel Rendón. This is the first edition of this collectible series. This box looks like a new production but has the old style hinges and clasp. Bottle Number: 08856 - Date: 07-V-96 (07 May 1995). Tequila Reserva de la Familia was introduced in 1995 to celebrate the 200-year anniversary as the world's leading producer of tequila. Each bottle is handmade, numbered, dated and sealed in wax. 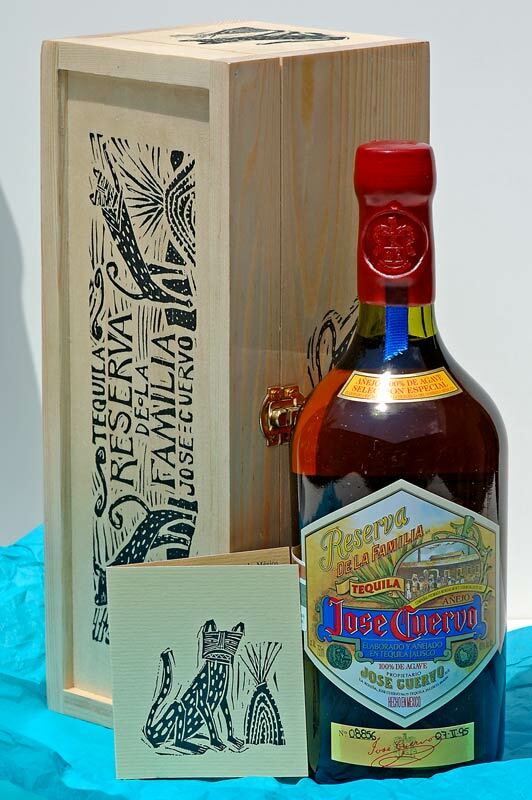 Every year the Cuervo family commissions a different Mexican artist to design the artwork for collectible box for Jose Cuervo Reserva de la Familia. "The box was designed by Mexican Artist Joel Rendon in 1995. 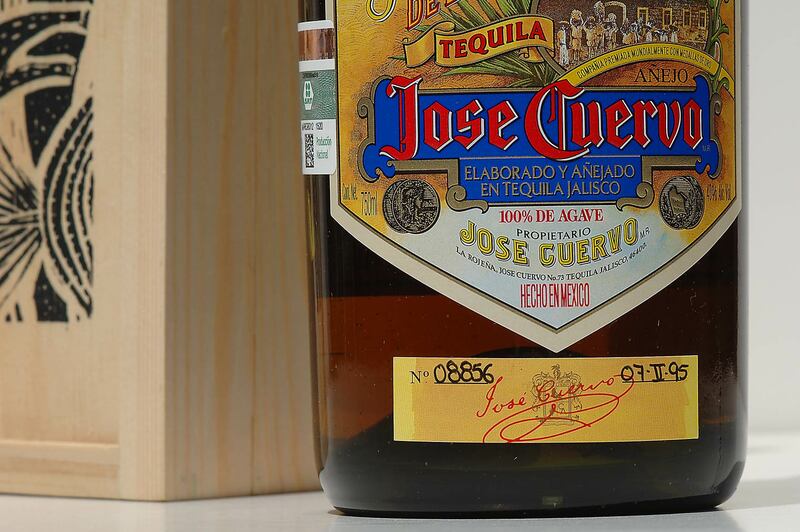 For the celebration of the 200th Year of Jose Cuervo, the engraver Joel Rendon has been chosen. Born in 1967, his work has been shown in more than twenty exhibitions in Mexico, the United States, Columbia and Cuba. He received the Young Creative Artist's scholarship from the FONCA and the distinction of Artist-in-Residence at the Art Institute of Chicago. The work engraved on the wood box was created specially for Jose Cuervo. Prior to their transfer to wood, these images were originally engraved in linoleum and printed on 100% cotton paper." 1995 Collection - Artist - Joel Rendon.